Posted by Michael Reedy on February 10, 2019 in Hockey, Sports, Top Stories. Ferris hockey dropped their second home matchup of the weekend against the Bemidji State Beavers by a score of 6-1. 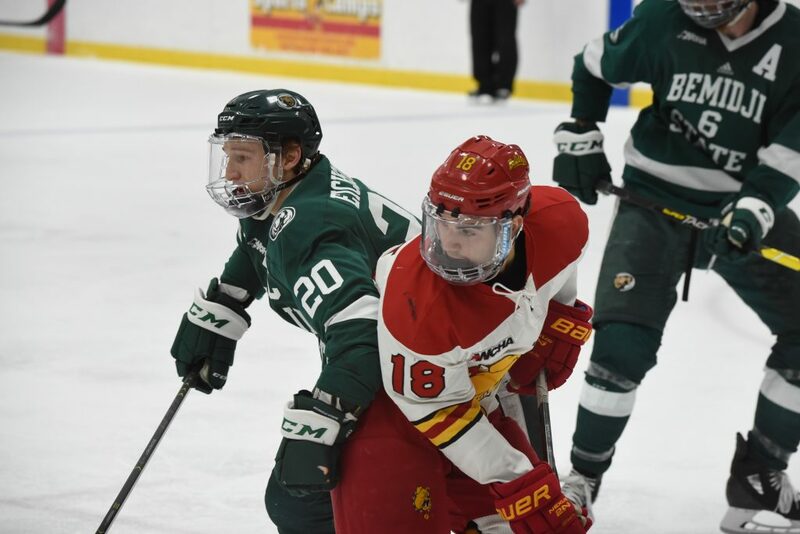 As Ferris came off a close 3-on-3 overtime loss the night before, the Bulldogs looked to skate in the right direction to get much needed conference points late into the season. The loss from Friday, Feb. 8, goes down as a tie and Ferris still received one point, but the Bulldogs’ struggle continued, and they were unable to come away with any points Saturday, Feb. 9. Just like the previous night, Bemidji State, who has an overall record of 14-12-4, was the first of the two teams to get on the board early on during the first period, which came off the tape of Bemidji freshman forward Owen Sillinger. It appeared that Ferris would head into the locker room just down one goal, but two penalties left the Bulldogs with just three skaters on the ice, and Bemidji took advantage to head into the second period up 2-0 off a goal from senior defenseman Justin Baudry. “We came out of the first period down two-nothing and I felt that though we had played a decent game,” Ferris head coach Bob Daniels said. The Beavers came out red hot in the second period and it did not take long for Baudry to get his second goal of the night and increase the lead to three, making it 3-0 just two and a half minutes into the period. Another pair of penalties the Bulldogs committed would cost yet another goal, the Beavers’ second power play goal, this time by Bemidji senior forward Jay Dickman. A five-minute major by Bemidji brought a ray of hope to the Bulldog offense, but it was thwarted by a shorthanded goal, which increased the Beavers’ lead to 5-0. Ferris junior defenseman Nate Kallen put the Bulldogs in the right direction when he scored the first goal of the night for Ferris, which made it 5-1. Bemidji thought otherwise and added their fourth goal of the period, changing the score to 6-1. Play appeared to settle after the second intermission of the game and took a break from the Beavers being able to capitalize in the first few minutes of the period. Ferris was the one to up the pressure during the third, and they had seven shots before Bemidji could get one of their own, which came more than halfway through the period. Both teams remained scoreless during the third period and the final score was 6-1. Ferris’ playoff push will continue Friday, Feb. 15, as they head up north to take on Alaska-Anchorage. The puck will drop 11:07 p.m. EST.